Tasmanian peppercorns are found mostly in… Tasmania! But they also grow in Victoria and New South Wales. 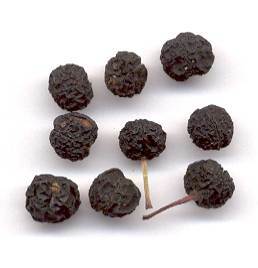 Tasmania’s native ‘pepper’ is one of nine genera from the winteraceae family, also known as a Mountain Pepper. These black berries are hand-harvested between March and May. We have described them as sweet, fruity, succulent and spicy. The berry is fairly soft and has a crunchy seed cluster at the center. The flavor experience of the Tasmanian peppercorns is dynamic, from sweet fruitiness to a short-lasting intense heat that finishes with a menthol-like numbness similar to Szechuan pepper. They are a great alternative to regular peppercorns though they should probably be used and treated differently. They infuse broths for soup or cream for chocolate truffles with a wonderful aroma. After poaching they berry loses its heat but maintains an almost currant like fruitiness and texture. The berry after poaching can be a interesting edible garnish. Pickle the berry with mustard seeds and it adds a vibrant red color as well as a neat kind of heat. A few folks have been using them in charcuterie as well, and we can’t wait to taste those salamis! We don’t carry a lot of spices, but those we do carry are remarkable. Enjoy! ← Kishibori Shoyu – or – Shoyu Think You Know Soy Sauce?